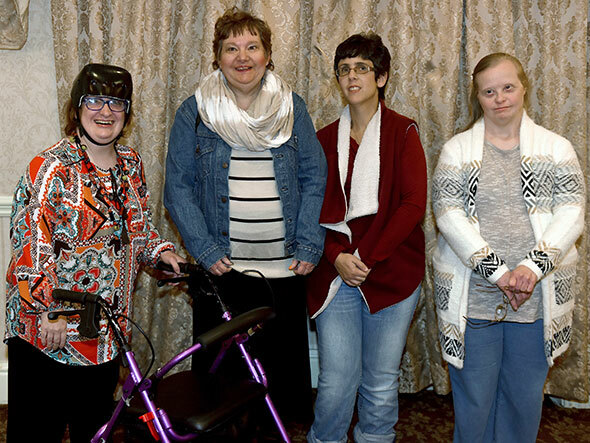 New Horizons Resources hosted its 15th Annual Fall Into Fashion Show on October 18th at the Poughkeepsie Grand Hotel, with models wearing fashions from six local department stores. Models showcased the latest fashions from Banana Republic, Poughkeepsie; the Pleasant Valley Department Store, Pleasant Valley; A Special Occasion, Fishkill; Simplicity, Poughkeepsie; Rambling Rose, Newburgh: and Catherines, Poughkeepsie. Local hair stylists and make-up artists donated their time to ensure every model had a completely professional look. Michelle Taylor, co-host of “Wake Up with Joe and Michelle,” provided commentary for each of the models and helped give out over 25 raffle items to over 115 attendees. 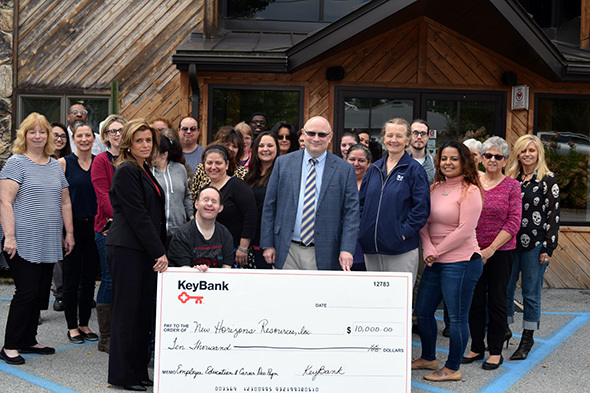 Thank you KeyBank for your generous $10,000 contribution to New Horizons Resources. The money we received from KeyBank will help us pay for employee certifications in skills such as CPR, choke prevention and first aid. It will also help fund our college tuition reimbursement fund. We are truly grateful for your support. New Horizons Resources, Inc. has officially opened a multi-sensory room at our administration building in Pleasant Valley. This new resource will extend our ability to support people with Autism and other developmental disabilities who process sensory stimulation differently. The room will initially be used to support people attending NHR’s day hab program but will be extended over time to others who could benefit from the environment. The room is designed to block out certain types of noise or visual stimuli and increase the types of sound that are calming and help people maintain emotional balance. Over time, the sessions can help people feel more comfortable in all their environments. 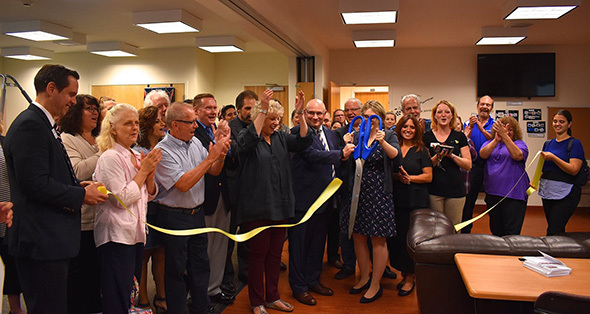 Frank Castella, President of the Dutchess County Regional Chamber of Commerce presided over the ribbon cutting. Elected officials attending included Assemblywoman Didi Barrett and Pleasant Valley Town Supervisor, Mark Figgliozzi. Deputy Commissioner for Special Needs, Toni-Marie Ciarfella also attended. 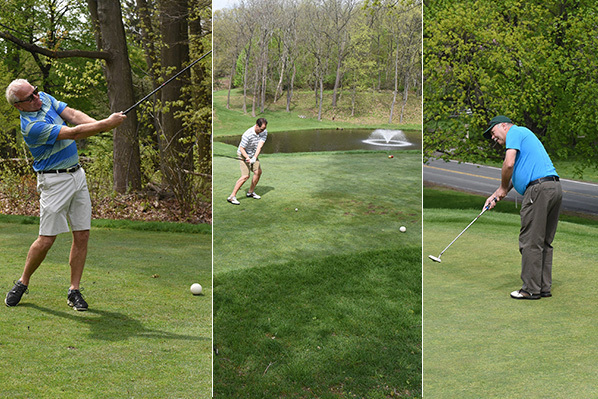 One hundred and eight golfers joined New Horizons Resources for its 35th Annual Invitational Golf Tournament at the Powelton Club on Monday May 7. Click here for a wrap up on the day and the names of the prize winners. 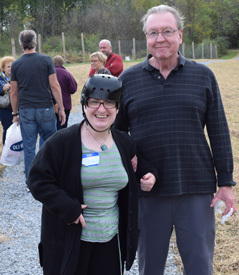 New Horizons held its annual family and friend’s picnic on Sunday October 15 at our Briggs Farm site in Poughkeepsie. 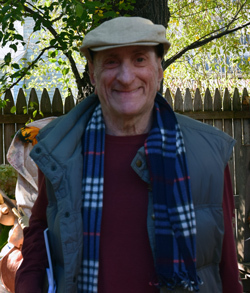 People receiving both residential and day supports from New Horizons were joined by their loved ones for a breezy, cool and sometimes sunny day that started with coffee and donuts donated by Barton Orchards and Fishkill Farms. For lunch there were heroes and salads, followed by a group sing along. Many attendees enjoyed a walk on our new multi-sensory walking path, which had its unofficial opening at the event. People visited the farm animals and the children enjoyed climbing on hay donated by Hahn Farm. Our local officials joined us including Toni-Marie Ciarfella, Dutchess County Deputy Commissioner for Special Needs, NY State Senator Sue Serino and US Congressman John Faso of the 19th District. Thanks to all who participated and helped make it a great day. 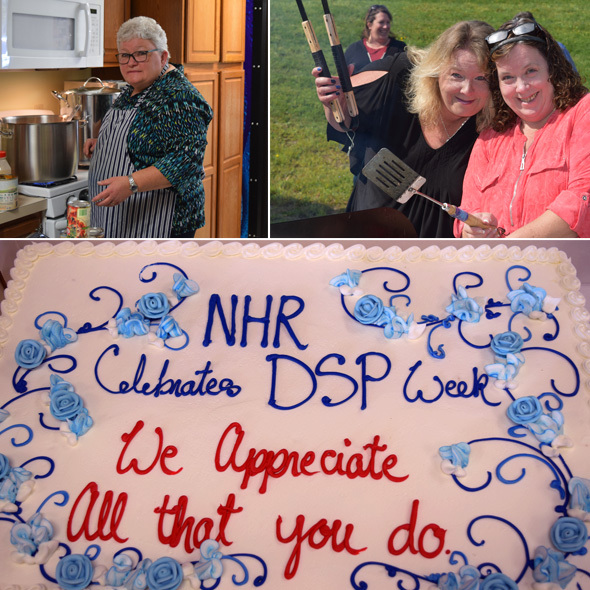 Thank you to everyone at New Horizons who worked on or participated in honoring our direct support professionals during National DSP week 2017. From a picnic, to raffles, to the wonderful stories that were shared, DSPs were honored for their professionalism and consistent grace under pressure. Barbara Mika, our director of residential services, with help from the HR team, personally prepared a homemade tray of baked ziti for every house and day program during the week. DSPs are MVPs! Thanks for all you do. “I would love to!” Lynne enthusiastically replied. That was Jamie Snider, a NHR community home resident, and Lynne Versaci, a representative of NYS Senator Sue Serino, at the big 10th Anniversary Party of the home Jamie and his steadfast housemates – Aaron Abolofia, Jeff Gamble, Andrew Kessler, Luke McElduff, and Kevin Leonard – have shared all that time, on Angelo Blvd. in Lagrange. Jamie did a terrific job showing off his room, and Lynne was clear in her public remarks about just how delighted she was with all the men at Angelo Blvd., and how much she learned about NHR. In our time of harsh political manners, Jamie and Lynne’s small interchange represented an incisive example of - and goal for – how the government and its citizens should relate to each other: respectful and responsive. And the party was wonderful! The parents of the residents, the easy-going and insightful house manager Paul Thorstenson, and the men themselves, energetically organized it. They all happily cooperated on bringing together the soda, water, ice, green salad, appetizers, hamburgers, sandwiches, and fruit salad, as well as the hot dogs and ice cream donated by Stewart’s. Most important of all were the 100 high-spirited guests, including friends, relatives and neighbors of the men, the visionary and resolute NHR executive director, Sam Larganaro, the beloved former house manager Monica Robinson, oh-so-many delightful current and former staff members, and NHR residents from other community homes. After 10 long years the party gave me exactly what I thought was NOT possible: even more gratitude for what I was already more thankful for than anything else in the world: the reality of a full life for my oldest son, Kevin. Naturally, I’m grateful to America for its mysterious and true faith that all are created equal, to the enlightened laws that guarantee this belief, and the Medicaid funding that enacts it. I appreciate the vital work of the New York State Office for Person With Developmental Disabilities and our local state Developmental Disabilities Service Office. I also live with daily gratitude to the NHR administration that addressed neighborhood resistance to open the home, organized the home with care (and flair), and still strives to improve operations. 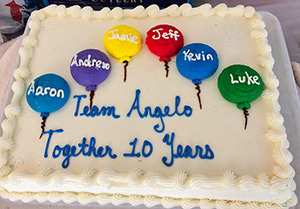 I’m most grateful to every - yes every - current and former administrative staff member and Direct Support Professional that has worked at Angelo Blvd in the past 10 years. Together this great American coalition delivered the possibility of a good life for an unusual citizen. Kevin, 36, is now a happy, out-going, and extravagant man with autism and intellectual disabilities. He sings in a community chorus, is very alert to other people’s feelings, and bounds up steps two at a time. Although he stopped believing in Santa Claus at 33 years old, he is still devoted to the Muppets, has a fondness for outrageous costume jewelry, and talks to his hands at unexpected times. When Kevin went to the group home at Angelo Blvd ten years ago I was confident that he would be well cared for –that he would have a healthy diet, receive medical care and be occupied during the daytime. But over time some miraculous things happened. Not only did the men in the house become friends, but because of the unspoken understanding that all the parents shared each other’s deepest concerns they also became friends, developing a genuine fondness for the men that were not their own sons. Yet most astonishing: with the unheralded, every-single-day supports at NHR, Kevin has achieved something I didn’t even have enough insight to hope for: a place in his community. At the 10th Anniversary Party Kevin unselfconsciously flaunted the richly human life he lives. Sporting a big, straw hat, endless bracelets and a bright red “Bette Midler Hello Dolly” tee shirt, he greeted every guest with an exuberance akin to the show - his favorite show – that his shirt advertised. Kevin was so busy delighting in each guest’s arrival that he spent very little time with his own family. This show of independence was particularly thrilling because it highlighted his participation in a community – the very thing a family cannot provide. It was also uplifting to see this connected independence, rather than the dehumanizing isolation that I secretly feared. And I promise: because of this, the men have thrived, and their families appreciate it - forever. Listen to Peter Leonard and Julia Kessler speak about what Angelo Blvd. has meant to their sons and to them. They speak about the vital role of DSPs, NHR's long-standing commitment to quality supports and the role of Medicaid in ensuring basic human rights. This conversation is part of the radio show Finding Out and was originally broadcast on 8/13/17. Click the link below to listen. First day campers at New Horizons meet the staff and get ready to head out and explore the community. Summer camp began at New Horizons on June 26th when seven excited campers dropped their gear at our administration build and set out on a week of adventures around the community. They had a quick snack before heading out to Billy Beez in Middletown and an afternoon stop at Bounce in Poughkeepsie. The New Horizons summer camp gives young people an opportunity to get out and experience all the different learning and recreational opportunities that the Hudson Valley has to offer. Have a great time campers! Thank you DSPs! Saturday June 10, more than 30 people representing New Horizons Resources joined 300 runners, walkers and wheelers in the second annual Think Differently Dash on Main Street in Poughkeepsie. Participants from NHR included people receiving residential and day supports, DSPs, administrative staff and their families. The Think Differently Dash was the kickoff event of Marathon weekend in the Hudson Valley that included a 5K, a half marathon and a full marathon. Each agency represented in the race was invited to appoint a Grand Marshall and Todd Motter, who lives in a New Horizons Resources supportive apartment in Poughkeepsie, volunteered to fill that role for New Horizons. Every participant who completed the race received a commemorative medal from one of the race directors or an elected official and then enjoyed refreshments and live music on the Town Square. home in their apartment in Poughkeepsie . Among the Mountain Brook Apartments in Poughkeepsie, there live five newly independent people receiving supports from NHR. They are building skills in many areas: budgeting of money for food, household necessities and eating out; learning transportation schedules; developing interpersonal skills to succeed in living with an roommate, etc. In addition to receiving supports from DSPs, these five are learning from and supporting each other by visiting each other; waiting together for a Poughkeepsie Loop Bus or ride; and simply staying in touch with each other with a phone call for advice. Our first visit takes us to the apartment of Allison Heady and Alicia D’Eufemia. Allison is the navigator throughout all the interviews and seems to be the strong unflappable constant for all the group to find guidance when seeking aid in solving a problem or in need of advice. In both these ladies' home one can feel warmth and a welcoming atmosphere to sit on the big comfy couch to talk. Both ladies enjoy the freedom to go to bed when they like. Eat what they choose at any time of the day within their budget and diet. Both rely on each other to check cabinets for replenishing food or other products. They appreciate not relying on 24 hour staff to tell them what to do next. Jocelyn Murray’s and Wendy Hawkins’ apartment is further back from the main entrance of the apartment complex. The focal point of the apartment is the homey inviting lure of the dinner table where one can chat and laugh about funny cooking mishaps and overcoming obstacles. Jocelyn loves sports like basketball and football. She's very proud of her skills using the microwave and making leftover food for her lunches the next day. Wendy loves to use the microwave as well and helps plan the grocery list with staff that comes in the evening. She is very different from Jocelyn. Jocelyn likes being alone and thinking about sports. Wendy does not prefer sports but is learning to compromise with Jocelyn so she may watch the football game on the large television in the living room on Sunday evenings. Wendy loved having a 24 hour staff before she lived on her own. It was quite an adjustment and she will call Allison for advice to help her make her decisions. Wendy is surprised that she is emerging into an independent person. She never thought she could make decisions on her own or enjoy not being told what to do next for each activity of her life. She is surprised how free she feels and is proud she is coming out of her shell. Around the corner to the back of Jocelyn’s and Wendy's apartment lives the very determined industrious Todd Motter. He has taken to living on his own (with roommate Ryan) with full force and a new opportunity to fulfill his dreams. Whenever he can, watching out for safety rules, he glides through the streets on his red mountain bicycle to the convenience store or to K-Mart. He attends self advocacy meetings and helps conduct interviews with DSP applicants held at the West Road training and administrative center. Todd loves having the responsibility for and control of his own money and food shopping. 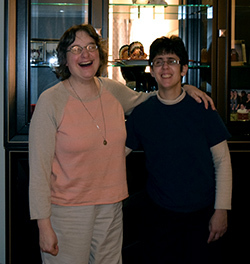 While staying in touch with staff, Todd visits friends supported by NHR, the ARC of Dutchess and Abilities First. One obstacle he needed to learn to overcome was being aware of the different fares expected while taking the Loop Bus in Poughkeepsie to various destinations. Todd is so happy that family can visit often and the location is near meetings and his work. He has wanted to be on his own for a few years and this opportunity was one that did not come too soon for Todd! These five young people (and several others who are also supported by NHR in apartments on Innis Avenue) have talented and dedicated DSPs to provide a support system to ensure their success in living independently. Alison, Todd, Alicia and Jocelyn enjoying time together at Jocelyn's and Wendy’s apartment. While competently supported by experienced DSPs, they also support each other as they develop skills living more independently. Todd Berk, artist, musician, neighbor. Local artist Todd Berk is well known in New Paltz. Enter into the quaint rustic yet bohemian social hub of New Paltz called The Bakery. People wait on a long line with smells of bacon and eggs on bagels, toasted oat nut raisin bread, and strong Kenyan coffee fragrances the air. Three staff take orders all at the same time with shouts from customers of, "a shot of coconut flavoring, please in my coffee!" or " taste the pumpkin almond nut muffin, it's delicious!" You also can hear a gentleman named Todd Berk, ask the customer on line after him, "Are you an artist?" The customer from a yet unknown place, answers, surprised, "Why yes, I am". From that beginning, the two talk about art they are interested in, the climate in New Paltz, surrounding areas of interest as well art exhibits coming up in the near future. That conversation ends with smiles and fond good-byes. Todd then begins to ascend the stairs to the next level with works from local artists lining the walls of the stairwell. There are photographs of nature and children in high grass as well as paintings of bridges illustrated in pastel colors. As Todd reaches the 2nd level dining area, he sees friends and new potential friends to chat with as he enjoys his hazelnut coffee with The Bakery's big chocolate chip cookie. Todd is, in a very real sense, home. 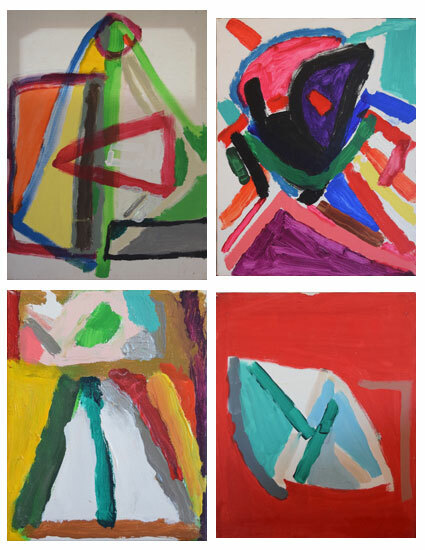 A quartet of abstract art by Todd Berk. As an artist, Todd is most well known for his abstract art which is filled with shapes and bold colors that seem to fit together puzzle-like. The shapes fit into corners or edges where the colors begin and end. You may well have seen Todd’s art firsthand as his designs are featured every month in the birthday cards that NHR sends to people receiving supports and staff. However, this form of the arts is not the only passion Todd nurtures. He is also a harmonica player and a great lover of ALL sorts of music. His collection may begin with a Glen Miller Big Band music from the late 1930's or 1940's to Elvis Presley, the Beatles, Nino Tempo and April Stevens to Frankie Valli and The Four Seasons, Cat Stevens, and Rod Stewart, and The Muppets and all between and beyond. Todd can name that tune before the announcers on WGNY 98.9 on the Oldies radio station! He recognizes most of the time which instrument is being used in the song and if not, he researches it on social media. He can communicate the "music language" to other musicians when popping in a music store. Todd is extremely proud of his knowledge and likes to surprise people with how much he actually knows. Recently he attended a Four Seasons performance in New York City with his beloved sister, Lisa Seligman and Jansen Road Residence Coordinator Brooke McNally. New Horizons Resources, Inc. is a not-for-profit agency that provides services to children and adults who have developmental disabilities and live in the Hudson Valley region of New York State. NHR was founded in 1974 by a group of parents seeking alternatives to institutionalized care for their sons and daughters. In 1981, the agency opened its first residences for adults with developmental disabilities. The agency’s founders wanted to create services that would provide a home and the reasonable assurance of lifetime care. They also wanted to give people with disabilities opportunities to build friendships and establish relationships in their communities. Today, NHR offers services to 450 people who have disabilities where they need them most: in their homes, at their work sites, or in our community-based residential programs. 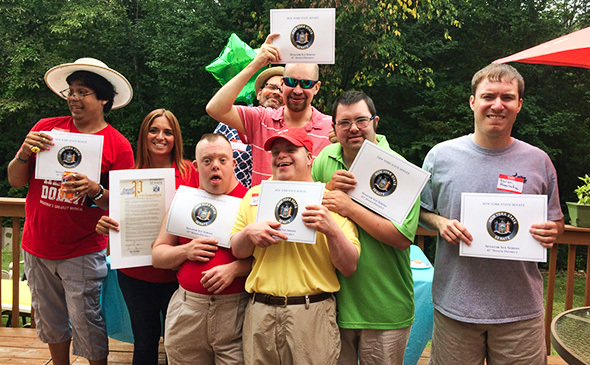 The goal at New Horizons is to provide individuals who have developmental disabilities with opportunities and environments where they learn the skills and develop the confidence needed to live their lives as independently and as happily as possible.